Home Reviews Chicago Athlete #Reacts: What’s the Deal with the New Nike Shoe? 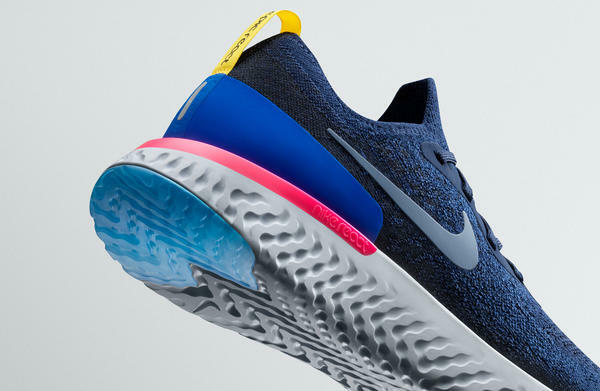 Earlier this month, Nike released its new Nike Epic React Flyknit, and runners around the world freaked at the possibility of a shoe that is both lightweight yet supportive and comfortable. Since then, #NikeReact ads have been popping up everywhere, and athletes wonder if the $150 price tag is worth it for the claimed-revolutionary shoe. Well, I got a first look at the shoe before it even came out, and have been trying it the past few weeks. I’m here to share my thoughts, but first, let’s talk about the details of the design itself. 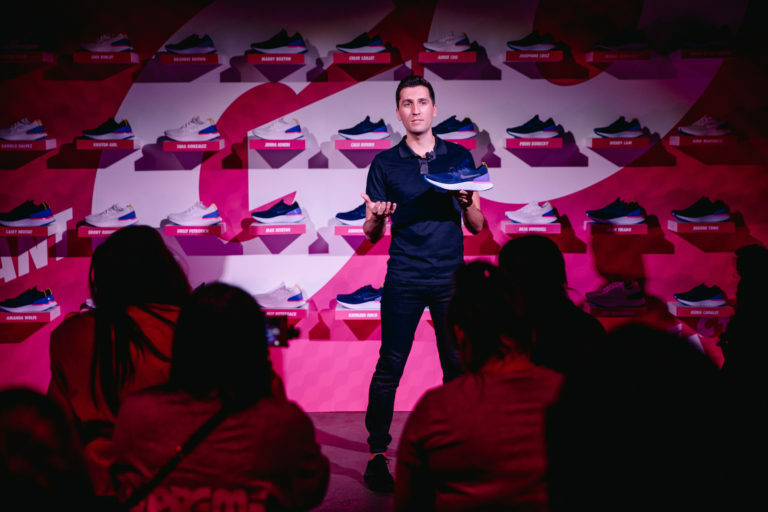 At the launch event in New York, Brett Holts, Product Line Manager at Nike, talked about the history of Nike’s design strategy; in fact, the original motivation to providing a lightweight cushioned running shoe stemmed from Nike’s early designs of track spikes. 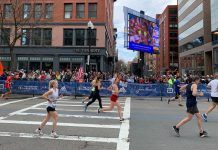 “The thin wedge in the heel of a track spike, which is only a couple millimeters, adds the balance of maintaining a lightweight product but allows athletes to put in miles and stay healthy,” Holts says. Then, in the early 1970’s, Nike produced its original Waffle Trainer, which was what jump started running shoes for the masses, Holts adds. Throughout the decades, designers have dedicated a lot of time to cushioning innovations and technologies for runners, and in 2008, when the original Lunar Trainer was released, the idea of athletes not having to choose between cushioning and weight started to become a reality. In June 2017, Nike launched the React foam in a basketball shoe, and users found it to be soft and springy while also stable. So, Nike engineers saw an opportunity to integrate this into running shoes as well. 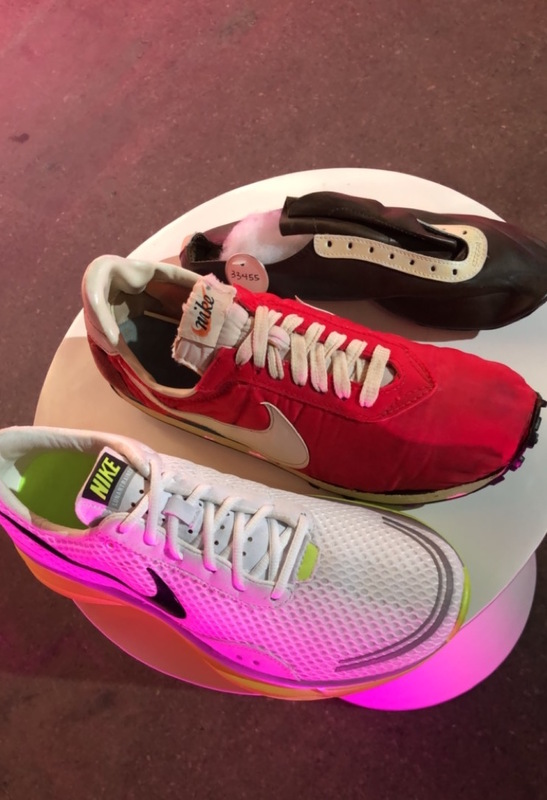 (From top to bottom) Nike’s track spike, the original Waffle Trainer and the original Lunar Trainer. So, what is the final formula? Well, Holts says there are three main components that make the Nike Epic React unique. The first is how it fits; although Nike has been using Flyknit on its shoes for quite some time, the seamless Flyknit is something new. This allows the design to be simple, while adding breathability and stability, and accentuating how the foot looks in the shoe with the low-cut silhouette. In fact, style is another important component to Nike, as athletes should look good to feel good. 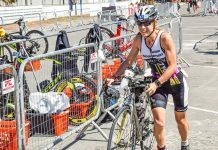 The third component, and arguably most important, is the ride. The pattern on the bottom of the shoe is fluid, to allow versatility among terrains, and adds to the longevity. 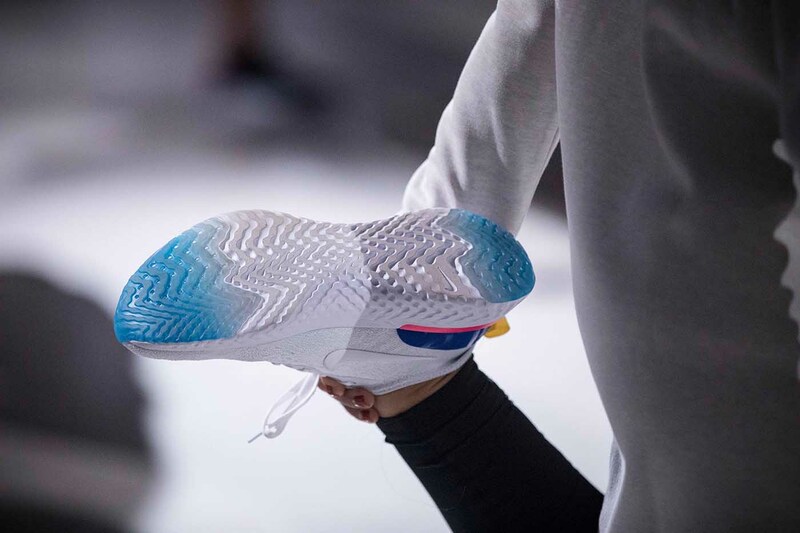 Holts says that many athletes have taken this shoe over 500 miles, and claim it still feels new because the cushioning is a specially formulated synthetic rubber that does not break down as quickly as other rubbers. Nike chemists have kept this algorithm secret, and the cushion itself is built entirely in-house. All of these technical terms aside, why does Nike think this is THE running shoe for runners? 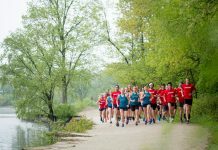 Mostly because of its versatility; not only does it last a long time, is good on all terrains, but elite athletes themselves say that it works in short, fast workouts the same as it does in the steadier, longer runs. When I first put the shoe on, I immediately noticed how the Flyknit hugged my foot; it literally felt like I was just putting on a breathable sock. The cushioning felt sturdy yet comfortable, and my foot didn’t sink nor feel stiff. At first feel, I was impressed. The protruding heel in the back definitely took some getting used to – when you stand in it, and rock back a little bit, it almost feels like the shoe is catching you, which is a unique feature. When actually running, it’s not as noticeable, but it definitely looks like it’d feel like a rocking chair. The first time I ran in these was outside on the road, and they felt great. I really didn’t even notice the shoes at all, that’s how comfortable they were. For someone with bad knees, I’ve tried several shoes that claim to be both lightweight and supportive, and feel pain after the first few miles. In these, I did not. Running on the treadmill was a different experience; somehow, the shoes felt heavier and I definitely struggled to keep going. I’m not going to blame the shoes entirely, as my legs felt heavy from the previous day’s work out, but I do think I’ll keep these shoes for outdoor runs. Style-wise, I love them. The colors are unique and I do get a lot of compliments when I wear them. In fact, I’ve worn them a few times throughout the day when I know I’m going to do an afternoon run, and they’re extremely comfortable. The Nike React could serve as a lifestyle shoe as well, and even though the price tag may be a little high for that, I’d support it. When I asked Holts about the difference between this and last year’s Nike innovation, the Zoom Fly, which was the shoe that was supposed to break the two-hour marathon record, he said it’s an entirely different project. I think it’s a little too early to tell if this is the revolutionary shoe for runners, but I am impressed in the first few weeks. If it’s everything it claims to be, it does seem like it’d be the perfect shoe; but, as I continue my pre-marathon-training training, I will evaluate if they make the cut for the important parts of my season. The Nike Epic React Flyknit will be available online and select retailers on Feb. 22. Stay tuned for updated reviews of this shoe. Why have an article about this great supportive ‘light weight’ shoe, did I mention it’s ‘light weight’ and say something like its 8.7 oz. in men’s size 9.